Comics Impulse v2: Joe Mad! 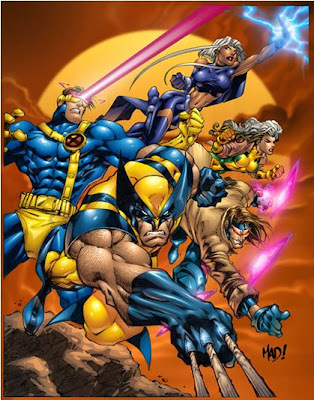 I'd like to shout out Joe Madureira for helping bring manga/anime to the mainstream comics like Uncanny X-Men. 10 years ago he began penciling and designing new costumes & character, modernizing Marvel's merry mutants. Joe left X-men in 1997 to pursue his own intrests...namely Battle Chasers, which to this day has a strong cult-like following. Nowadays he works on game designs and was at last years' E3 . Hopefully he'll make a return soon? I sure hope so. Click here for 3 classic interviews. Check out some of his work on my official Joe Mad thread on my forum for some of his work, even unreleased promo work. Also, check out Joe Mad Fan for the latest and greatest from Joe Madureira.